Ever wondered how fast your hard drives are? There are some tools out there to benchmark your system, but did you know there are tools built-in? The tool I am talking about is WinSAT.exe. WinSAT is the command line tool used to update you Windows Experience Index. My guess is that the most commonly used parameter used is formal, this will rerun the full set of all assessments. The tool can also be used to pre-populate the scores, run specific tests or forget all the history – just run winsat –? and you will get all the options. Tip! Use this tool to make automated benchmarks of your computers before putting them in production in your enterprise. Here you can see some parameters not showing when use winsat –? or winsat disk –?, so how can we use this? You can combine in almost any way you want to make your test. -ran Assess random IO performance. Cannot be used in combination with -seq or -flush. -seq Assess sequential IO performance. Cannot be used in combination with -ran or -flush. -write Assess write performance. Cannot be used in combination with -read or -flush. -read Assess read performance. Cannot be used in combination with -write or -flush. -flush Assess disk performance in write policy flush mode. Cannot be used in combination with -seq, -ran, -write, or -read. -drive [DRIVELETTER] Identify by drive letter which disk should be assessed. Cannot be used in combination with -n.
-count [1-50] Specify the number of iterations to perform. The default is 1. -n [DISK NUMBER] Identify by physical disk identification number which disk should be assessed. Cannot be used in combination with -drive. Previous Previous post: Why should I update my storage and display drivers? 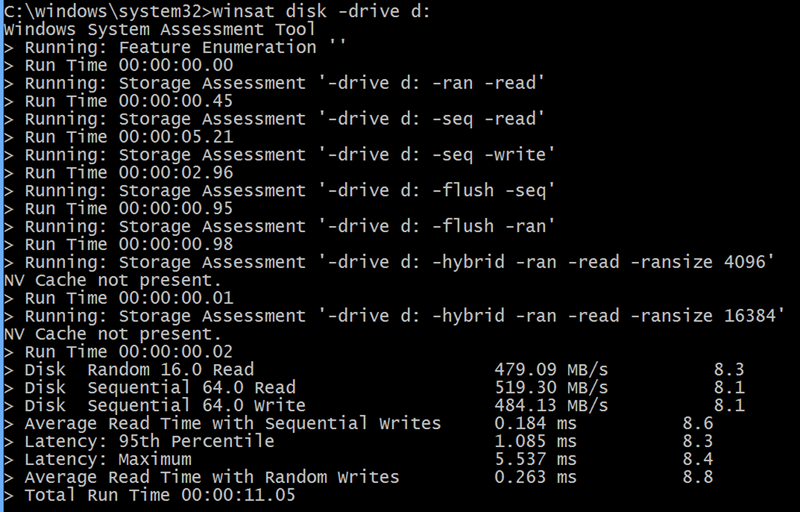 I just tested on what I have available (Windows 8) and “winsat disk -seq -write -drive c:” work fine. But it could be that W7 doesn’t like the colon. Thank for you comment! Yes, my mistake, the bug is only in Windows 7 and Vista. I too have a Windows 8 machine, and the version of WinSAT it includes does not appear to care if you include a colon or not. There is an error in this article. I don’t know what version of WinSAT you were running, but the versions included with Windows 7 and Windows 8 will reject a drive letter with a colon. For example, your “winsat disk -seq -write -drive d:” (colon after -drive d) failed, whereas “winsat disk -seq -write -drive d” (no colon) works fine.